Ahousaht elder Peter Webster was determined to preserve his family’s songs for history. Last month Canoe Paddle Song and Farewell Song, which were composed by Webster’s grandfather Tuu-sh-ka, were entered into the Canada Memory of the World Register, an offshoot of the Memory of the World Program created by the United Nations Educational Scientific and Cultural Organization in 1992. On March 27, Webster’s great-grandson, Guy Louie, performed the two songs at the Royal BC Museum in Victoria, accompanied by his mother, Pamela Webster, and uncle Hudson Webster. Louie said he became aware of the project when he was contacted by the Museum, and met with archivist Genevieve Weber. “I was asked if I knew the songs, and, if not, if I could learn the songs, and sing them at this event,” he said. Louis said he is called on to perform at elementary schools and to serve as a face-to-face contact for students, in traditional clothing and bearing the authentic cultural artifacts. “Over the last 20 years, I have been on quite an amazing journey, both performing and learning – a lot of learning,” he said. Weber told Ha-Shilth-Sa that the Canada Memory of the World Register was created as a separate entity last year, independent of UNESCO. All told, six inscriptions were added to the register, two with specific Nuu-chah-nulth connections. Along with the Ida Halpern Collection, the Vancouver Island Treaties are now part of the permanent archive. Weber said it was exciting to have the national spotlight focused on the museum. The Webster family songs were already part of a collection by an ethno-musicologist, Dr. Ida Halpern. Weber said Halpern moved to Canada in the early 1940s, and in 1947, began her Music of the Folk project, which included meeting with Indigenous leaders from the Kwakwaka’wakw, Nuu-chah-nulth, Tlingit, Haida, and Coast Salish communities. 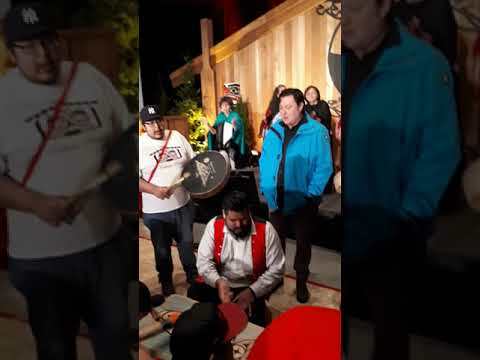 “They were becoming aware that there was a disconnect in their communities, where they would be unable to pass on their songs and ceremonies, or their language,” Weber explained. That was due to the cumulative effects of the residential school system, the ban on potlatches and a misunderstanding of the spiritual/family significance of the culture, she said. Those leaders had to find ways to maintain ties with other communities. Large sports tournaments became one opportunity for networking. At first, the leaders refused to commit the songs to recordings for Halpern, because of the sacred nature of many of them. As well, the traditional “copyright” on intellectual property such as songs and artwork (now recognized in Canadian law) applied to most of the material that Halpern requested. “Finally, one of the chiefs who had been refusing to make recordings with Ida Halpern, decided that he wanted to make the recordings, so that the songs survived, and could be passed on to his descendants in the future,” said Weber. Louie said the traditional copyright issue did come into play, and his family was determined to reinforce the message for the inquiring public. Weber said the Halpern collection carried a copyright through the museum, but the scientist was familiar with the rules of traditional copyright. “She understood how it was different from Euro-Canadian ‘ownership.’ And we want to respect that,” she said. For that reason, access to the recordings was very restricted, she said. Louie grew up in Victoria, and was familiar with the Royal BC Museum, but this was his first interaction with the archives. “Then I started going to the potlatches,” he said. “I spent a good portion of my life travelling to potlatches, to learn the way of the potlatch, and to learn the culture. Weber said that now, in effect, Peter Webster’s family songs have been enshrined as a slice of what it means to be a Canadian. Louie said that, despite the knowledge that he was making a contribution to history, the performance at the museum was more exciting than he had expected.